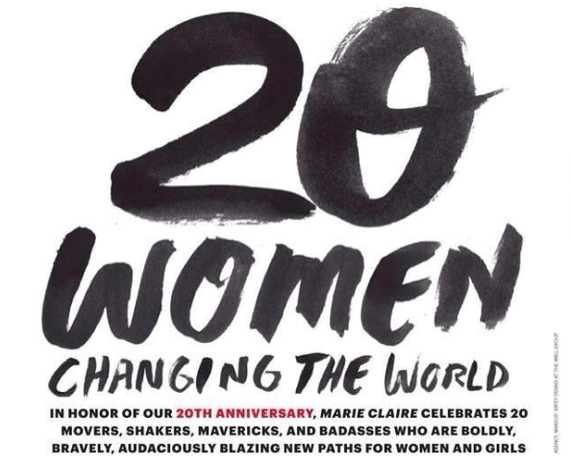 Recently, Marie Claire introduced a “20 Women Changing the World” magazine section in honor of its 20th anniversary. In a list including Chelsea Clinton, Eva Longoria, and Melinda Gates, Marie Claire spotlighted “20 movers, shakers, mavericks, and badasses who are boldly, bravely, audaciously blazing new paths for women and girls.” From Kimberly Bryant’s founding of Black Girls Code to empower young women of color through technology education, to Rachel Lloyd’s establishing of GEMS to help victims of domestic trafficking reintegrate into society, these stories were nothing short of amazing, wholly affirming my passion and deep sense of purpose in the movement to empower women and girls. Moved by these women’s untiring efforts to effect positive change, I immediately thought about one of my favorite extracurricular pastimes: running a weekly“Inspiring Woman Leader Spotlight” column as a volunteer with Women LEAD, a nonprofit organization that provides girls in Nepal with education and leadership development training. Nearly a year ago, I started conducting interviews for this column on Women LEAD’s blog because I wanted to highlight the efforts of female community and organizational leaders across the world. At the same time, I wanted to know more than what I could find on a biography or a nonprofit website. I hoped to learn, on a personal level, about a woman leader’s philosophy for change, why she believed her toils and struggles to enact women’s empowerment were worth it, and what advice she had to offer current and future generations of women leaders. I have been able to interview women leaders working in Hong Kong, where I live, and in the US, Canada, UK, Sweden, Laos, Sri Lanka, Rwanda, and Guatemala through Skype calling and emailing. These women leaders include journalists, entrepreneurs, academics, medical professionals, authors, high school and college students, who are all united by a common passion for removing bulwarks to gender equality. My weekly experiences canvassing these women for their views on issues including reproductive rights, violence against women, maternal health, and gender pay gaps have been so refreshing and enlightening, offering me alternate perspectives that contribute to my overall understanding of women’s issues. I’ve acquired an intimate knowledge of organizations that expedite women’s empowerment in both developing and developed countries, and the various socioeconomic forces that blockade gender equality in the communities where these organizations are based. The words that these women speak and write never cease to inspire me to continue fighting for women’s empowerment worldwide. Yet, as I interviewed these women leaders, I noticed that beyond the occasional celebrity spotlight in a magazine, there rarely is an active effort to regularly underscore the untiring work of women advocates and changemakers, whether online or offline. Girls’ Globe, a blog I write for that advocates and raises awareness of issues concerning women and girls across the world, frequently features blog posts about organizations and women working to secure a gender-equal future, and even organized a “Women Who Inspire” blog series to highlight the enlightened efforts of women changemakers. And The NextWomen, a women’s business magazine where I am an Editorial Assistant and Regular Contributor, boasts a “Female Heroes” section that specifically accents women leaders pursuing business and entrepreneurship-related paths. But excepting the few platforms that emphasize the power of women changing the world, where is this much-needed coverage? I call for a concerted and regular effort to celebrate the work of women changemakers for the very reason I love conducting weekly interviews for Women LEAD’s Inspiring Woman Leader Spotlight column. Spotlights like those in Marie Claire and on Women LEAD’s blog have the potential to encourage nascent women leaders to fight for the causes that matter to them, irrespective of any discrimination they may face, because they are armed with the knowledge that someone else has been there before them, succeeded, and inspired others. And when someone feels empowered by these personal stories of hope, passion, and resilience, who knows what phenomenal things they may be able to accomplish for women and girls now, or in the near future?